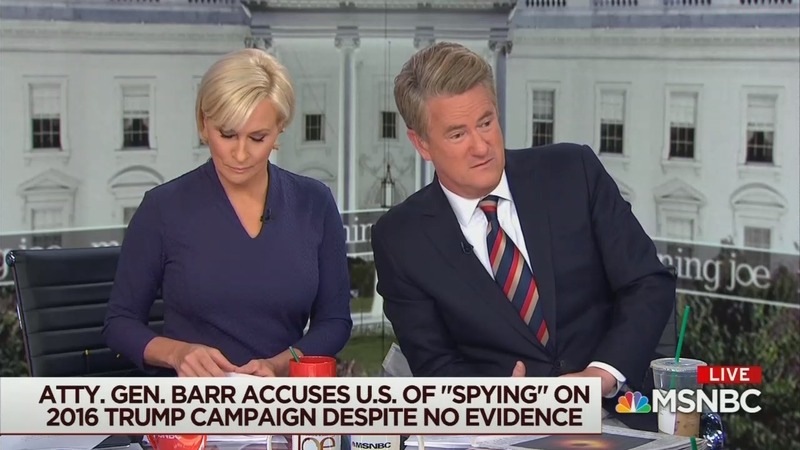 The lesson that should have been learned from the initial Barr letter was that the rush to conclusions during an investigation can result in shows like Morning Joe being discredited, but Scarborough is repeating the same mistakes. If the intelligence and law enforcement agencies of the federal government abused their power because they didn’t like a certain Presidential candidate, that is something everyone should be concerned about, even if they hate said candidate. MIKA BRZEZINSKI: Someone’s been Trumped. MIKE BARNICLE: He better rethink it. SCARBOROUGH: In the beginning he was really making a fool of himself, humiliating himself, and then he started to clean it up a little built more at the end saying, “Well wait, I don’t have evidence this is fine but I’m going to look into it.” Because It’s very interesting, very Trumpian to, first of all, put out a summary and make conclusions that you know is doing the president’s bidding, the type of summary that Roy Cohn would put out and then when people are on to you and you know you have to release that summary, now you throw more meat to the Trump ecosystem. SCARBOROUGH: Can I just say this is what judges would call dicta. He draw as conclusion that is meaningless, just words, because he himself has said that Donald Trump can’t get indicted. A president can’t get indicted. And if that’s the case, then your job, Mr. Attorney General, is to do what Mueller wanted him to do, pass it on to Congress, but he wanted to poison the well. He wanted right-wing talkers to go out and blab for the last three weeks and make fools of themselves “Told you so” before the report comes out. Now the report has come out, he’s thrown more red meat, which they just can’t help taking and their making fools of themselves again in fact, they did the first half of the meeting, and then they had to back off by the end of the hearings. BARNICLE: But in their terms and I’m talking about the Trump political apparatus now, in their terms on their grounds, it’s working, and this only adds to its effectiveness. ← Concerta vs. Adderall: What’s the difference?